Email marketing continues to rule the realm in terms of return on investment compared to other traditional and digital marketing channels. With the number of email users worldwide forecasted to reach 2.9 billion by 2019, and a 43-to-1 ROI, email marketing as a channel needs to be a focal for brands and marketers alike. Build your email list organically and refrain from buying lists. Emails should be sent to people who have opted in to receive emails from you—because these are the people who are interested in your brand. Purchased lists contain data about people who likely have never heard of you, or don’t want to hear from you, or (worst of all) don’t exist at all. Simply put: It’s better to have a smaller but highly targeted list of subscribers than a huge list of unengaged people who are unlikely to buy from you. Segmented campaigns generate 14.3% higher open rates than non-segmented, batch-and-blast emails. Segmentation can be based on any data point you have—age, location, past purchases, buying frequency, site usage, interests, email engagement, etc. If your standard emails are simply not generating enough engagement, segmentation is a great place to start. Timing and frequency of the emails is of utmost importance because you neither want to annoy your subscribers nor make them forget you ever existed. Statistics show that 86% subscribers like to receive promotional emails from companies they do business with at least monthly. Test days and times to determine what works best for your open and click-through rates and plan future email campaigns accordingly. An extension of segmentation, personalization can turn your great content into awesome, including great subject lines and more relevant content. According to Hubspot, subject lines which include the recipient’s name generate higher click-through rates–The open rate for personalized emails is 17.6%, compared to 11.4% for emails without personalization. Your content should be relevant and personable. Use numbers, images, humor and puns, GIFs and videos where appropriate. Interactive elements and dynamic content—where the content changes according to the subscriber’s likes, dislikes, browsing history, purchase history—can be extremely effective. Your emails have a purpose – tell them exactly what to do next and make that CTA prominent. Note: Check out these 9 tips to overcome email rendering challenges from our friends at InboxArmy. Welcome Emails – These emails confirm a subscription, let subscribers know what to expect from you, and the benefits they will reap by being your loyal customers. This helps to establish your brand. 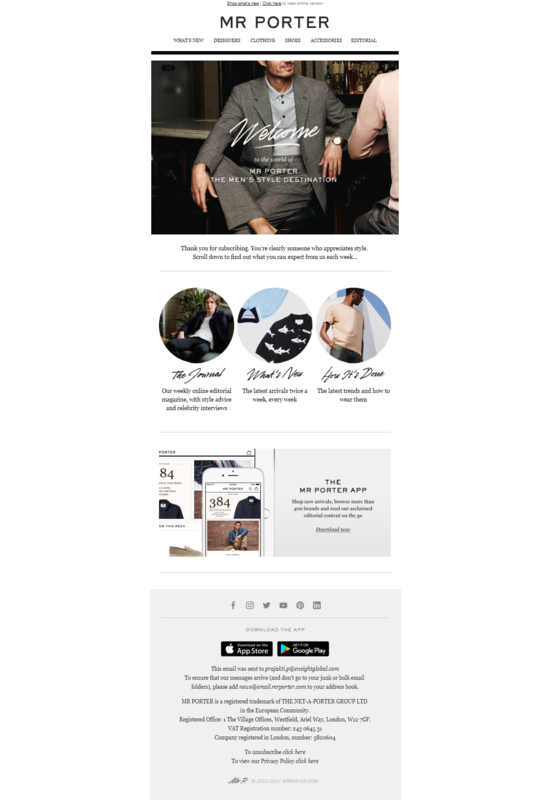 Check out this welcome email from Mr Porter. 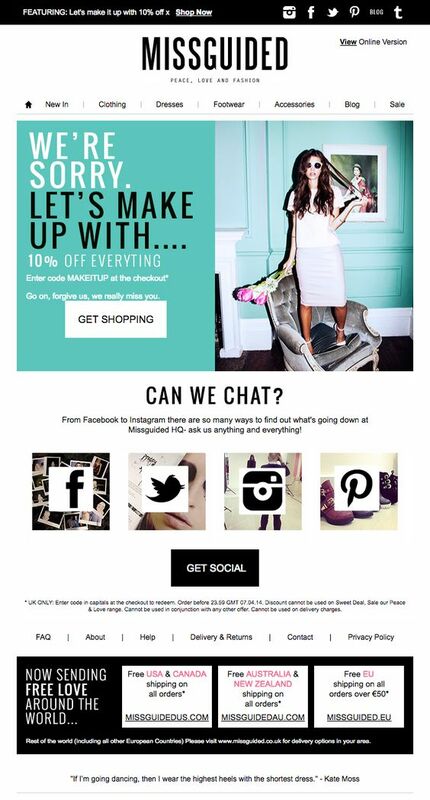 Engagement Emails – These are the emails which help to convert your subscribers into customers. Offering valuable and relevant content with discounts and coupons can nurture a strong and long-term relationship with them. 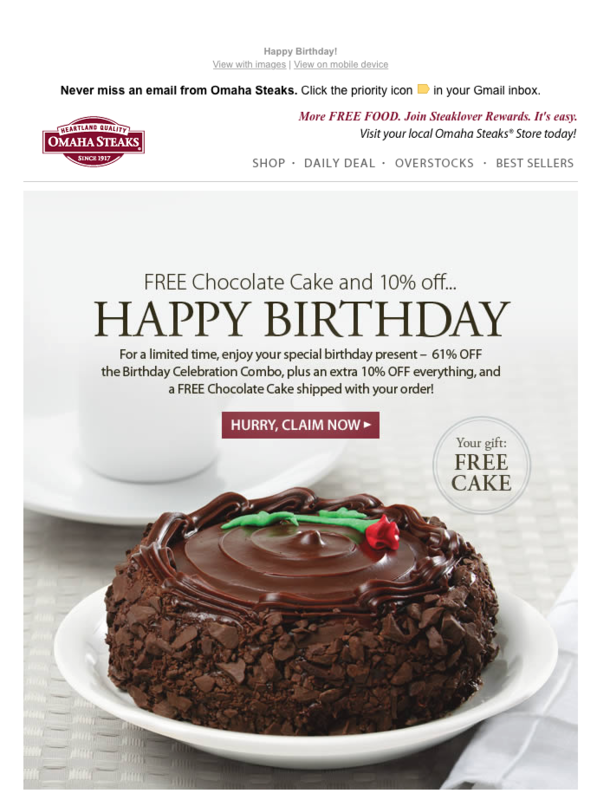 See below how Omaha Steaks sends a birthday email to their subscribers with a special offer to engage them. Transactional Emails– These are the emails sent after a customer makes a purchase. The hope here is that these emails not only confirm a purchase/transaction, but also convert a one-time buyer into a multi-time one. They are a great opportunity to upsell and cross-sell. This order shipment email from Levi’s informs the customer about shipping as well as showcases what’s new in the store. Re-engagement Emails – What if your subscribers no longer engage with your emails? Re-engagement emails come handy is such situations. These emails try to re-engage with the inactive subscribers and re-generate their interest. 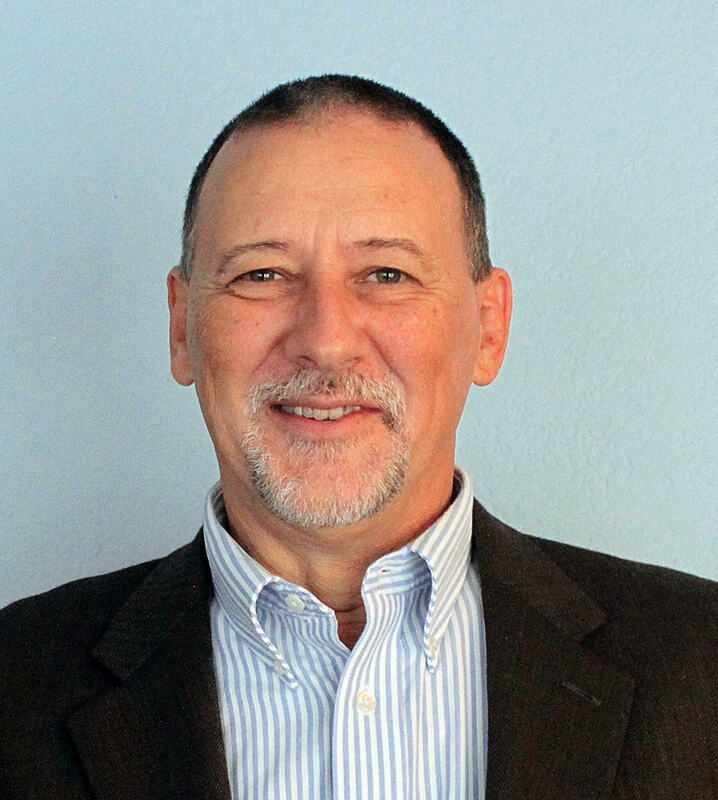 Too many businesses fail to recognize the importance of email marketing. 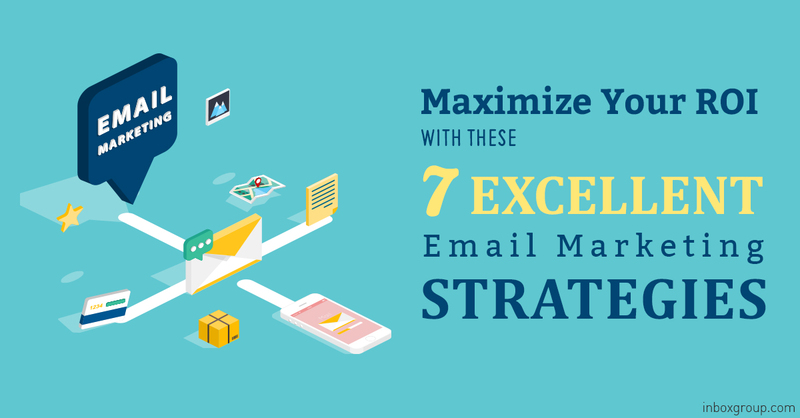 Implementing these strategies will help you create and send better converting emails. Want InboxGroup to help you out with your Email Marketing Campaigns? Get in Touch with one of our Email Marketing Experts.